You know, the beauty of a blog -- and one reason I enjoy the process so much -- is that it provides unlimited space. Another plus of this medium and its intensity is that it serves to remind me daily, and powerfully so, of my own limitations on several fronts, and that's a lesson worth its weight in gold. It remains ahead of me to know how to be still sometimes, but I digress. I've already started getting hell for this morning's appearance in the Grey Lady. But, hey, comes with the territory. While I was quite pleased with the story and the way it turned out, the difficulty, of course, is fitting everything into the space provided, especially when those great photos were considered. The reason your humble narrator was able to sound so coherent is that the summaries from which the quotes were taken were given in writing as opposed to in a phone interview. So, for the benefit of those curious for more, and because nothing beats fulltext, here is my complete summary as given to The New York Times. To complement the “Petrine pallium,” as its new-old form is now called, Benedict has been outfitted with a new set of particularly refined mass vestments intended to highlight the woolen garment and not distract attention from the papal face. Each, in bold colors, is interwoven with a muted pattern of Christian symbols. When the pope debuted an iconoclastic lime-green version at a St. Peter’s Basilica liturgy back in early October, to say that the Vatican’s legendary chattering classes were “shocked” – in the best possible way, of course – would be an understatement. When the new pope moved his massive library from his old Roman apartment to the Vatican, the collection – said to number about 20,000 books – was photographed shelf by shelf so that it could be reassembled precisely as it had been. With those kind of reading habits, not to mention the floods of paperwork which flow every day into the papal apartment and require the pope’s immediate attention, you’d need to take care of your eyes, too. Last June, Benedict raised eyebrows yet again when he traveled through the streets of Rome to meet Italian President Carlo Ciampi wearing chic Serengeti sunglasses atop his traditional “choir dress” of silk shoulder-cape, stole and the lace “rochet,” a jurisdictional piece of vesture worn by all bishops. Said to have been made on the day before its reappearance by the legendary clerical tailor Gammarelli (who have outfitted the popes since the 18th century), the camauro had not been seen on a living pontiff since John XXIII died in 1963 – John loved it so much his body, kept in a glass coffin on the Basilica’s main floor, wears it in death. In use since the 1100s, the cap was first intended as a means to keep the popes warm but, as tends to happen, it became such a status-symbol that their portraits would rarely be painted without its presence. Two weeks earlier, the annual papal trip to the statue of the Immacolata (commemorating Mary’s Immaculate Conception) on Rome’s Piazza di Spagna became another moment of glee for Catholic fashionistas when the pope rode in an open-top car wearing the “winter” mozzetta, a shoulder-cape made of the same material as the camauro and, yet again, trimmed with ermine. It, too, was returning for the first time in a long time, last being worn by Paul VI, who died in 1978. Both garments were said to be Christmas gifts from two European princesses who are longtime members of Benedict’s inner circle. Even PETA weighed in – not to condemn the pontiff for wearing rabbit fur, but to commend his longtime advocacy for causes of animal rights. Further proof that, ten months into his reign, Benedict is a pope of miracles. Used at his inaugural mass in late April, his first Urbi et Orbi (To the City and the World) address from St. Peter’s central balcony on Christmas and other major events, it’s notably high, made of cloth of gold and adorned with seashells – the latter being a time-honored symbol of St. Augustine, the 3rd century Milanese bon vivant-turned-African-bishop who the pontiff has long called his “favorite saint,” and on whom he wrote his doctoral dissertation. 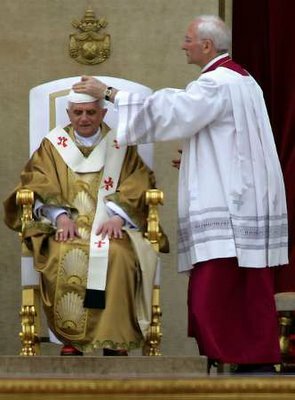 Given that Benedict’s pre-papal shield still adorns the back flaps of the headgear, and he doesn’t seem to mind all that much, it’s clear that Papa Ratzi isn’t willing to part with it for along. As papal regalia goes, the most paradigmatic change between this pontificate and the one which preceded it comes down to a matter of crosses – pectoral crosses, that is, which are suspended from a chain (or silk cord for formal events) and worn by bishops as a sign of office. For the entirety of his 27-year pontificate, the late Pope John Paul II used but one: a simple gold cross lacking all adornment. An exact replica of the one worn by his mentor, it was a gift from the people of his hometown of Krakow shortly after he was elected pope, and served as a sentimental tie to his beloved Polish homeland. By contrast, Benedict XVI made his first appearance as John Paul’s successor wearing a stunning, elaborately filigreed cross with an emerald setting at its center. For daily use, he dons a simple gold one without jewels – the “goods” come out for the masses and state ceremonies which dot the Vatican calendar. Another favored one with adornment bore a unique aquamarine cut in the center. And to start the season of Advent, which serves as the church’s run-up to Christmas, the pope went simple and wore a carved silver crucifix. John Paul shirked many of the ancient trappings of the papacy for a handful of reasons. He deep-sixed the winter fur as he was always warm to begin with but, more to the point, he wasn’t keen to allow the “props” to upstage what he saw as the main draw – his message, and himself. He may have served 24 years at John Paul’s right hand, but the man who took his place as Benedict XVI provides a study in contrasts. Joseph Ratzinger is as reserved a personality as Karol Wojtyla was outsized, and where John Paul was most comfortable with massive crowds, the new pontiff prefers the solitude of his library and has called his books his “old friends.” So it could be said that, given his natural shyness, the flashes of style exhibited by this pope provide a sense of allure about the man and a taste of the mystique and traditions of the office he’s inherited. If you think he’s all glam all the time, however, don’t be fooled – when the visitors are gone, he prefers to relax in a blue tracksuit.